Try these unusual and odd scholarships for college. Your creative talents will help you win scholarship money. It is possible to have fun and hunt for scholarships! Not odd at all! Award Amount $5000 first place each, $3000 second place each, $2000 third place each, $500 runners up. Same prize amount is awarded to the school. The duct tape scholarship belongs on every odd scholarships list. Do you have enough confidence to design and wear a prom dress or suit made from duct tape? 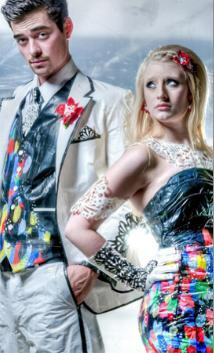 Use duct tape to create prom outfits and accessories and enter a photograph to the online scholarship contest. Must be a legal resident and at least 14 years old. This is one of the great unusual scholarships for girls because girls love to dress up, so why not dress up in your own creation for prom as a girl - girl couple? Girl - boy and boy - boy couples are allowed too in this odd scholarships contest. For duct tape scholarship rules and application see Duct Tape Scholarship. Turn your artistic talent into an odd scholarship! Design a greeting card for a friend, and you've given a thoughtful gift. But design it for a scholarship contest, and you might win $10,000. Submit your photo, artwork or computer graphic for the front of a greeting card. Designs should be appropriate for business and consumer use, such as birthday or Christmas cards. Must be your own original work. Open to high school, college and university students, and member of the armed forces. Must be a legal resident or have a student visa to attend school in the US. Must be at least 14 years old. Winner will be notified in March. For more information on the Create a Greeting Card Art Scholarship Contest, see www.gallerycollection.com/greeting-cards-scholarship.htm. Yup, everything really is bigger in the nation of Texas, in fact 100 miles bigger. If you live in Arkansas, Louisiana, New Mexico or Oklahoma within 100 miles of the Texas border and want to attend a public college or university in Texas, you may save some tuition. For more information about 100 Miles and you are a Texan, see www.collegeforalltexans.com . On a more serious note, there are many other Tuition Assistance Programs for out-of-state residents too. Application Deadline applications accepted from January 1 – June 15 each year. You must be a StarFleet member for one year to qualify. If you are a Star Trek fan, you can qualify for one of these unusual scholarships from another world. Medical, engineering, language, and more scholarships in honor of your favorite Star Trek character. For Star Trek scholarship requirements and information see scholarship.sfi.org.